Chilling. Powerful. Now, to be rendered into putty. Inspired by my new Platinum Edition Lord of the Rings DVD, I set out to create the one putty sculpture to rule them all. 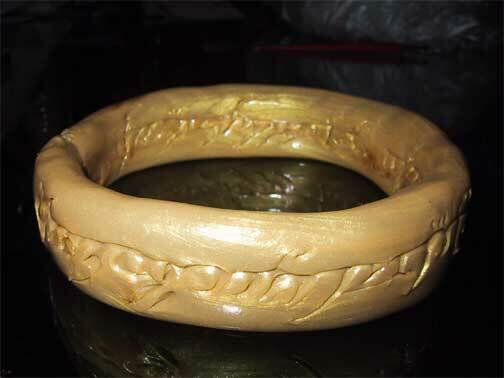 To recreate the One Ring in Aaron’s gold putty.I had some research to do first. I wanted to find the definitive ring inscription, with the proper treatment and spacing. I also wanted to learn a little more about the language and the letters used. 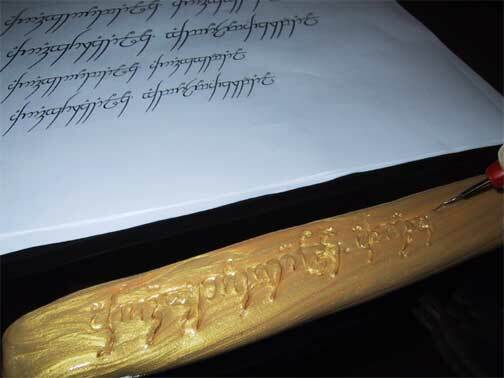 The font is called “Tengwar” and you can find all sorts of info on the web— these people are mighty serious about their Elvish fonts, let me tell you. A useful link from which I got pointers and Windows fonts was this: http://www.sci.fi/~alboin/tengwartutorial.htm. Being a fair calligrapher, I thought: Okay, this should be relatively straightforward. Roll out a sizeable wad Aaron’s famous gold putty, flatten it into a thick strip, inscribe the inside with the last 2 verses, flip it, inscripe the outside with the first two verses. Flip again to flatten the writing side, attach, and take pictures before the thing melts. Here I am inscribing side 2. A lot of time was wasted trying to figure out how to do putty calligraphy! I used a standard steel pen nib. Here I am inscribing side 1. Putty calligraphy is indeed a skill I had to learn and learn again. The putty tugged at the pen and caused it to skid numerous times. I got it right, finally, and it became a lot of fun. I had a lamebrain idea to put red sparkles into the inscription for the “fiery” effect. What a mistake! The glitter was not precise and ruined the clean lines of the calligraphy. What’s more, I wanted to rescue as much putty as I could so I literally PICKED OUT all the red sparkles. Yech! Of course after that I had to wad up all my work, reroll, flatten, and reinscribe. But… this task was appointed to me. If I could not do it, no one would. Woops. First attempt. 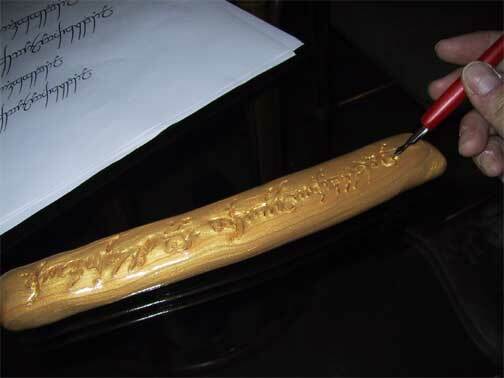 The calligraphy was fine, but the putty was a little too fat. One donut to rule them all. Maybe this is a movie tie-in that Krispy Kreme should consider. Wad, re-roll, flatten, inscribe again on both sides. These hours will never be returned to me. Truly, this putty ring is evil incarnate. But isn’t it beautiful? I have to take the pictures fast, because of infamous “putty melt”. I think this one can be destroyed without going back to Aaron’s mixing vats. 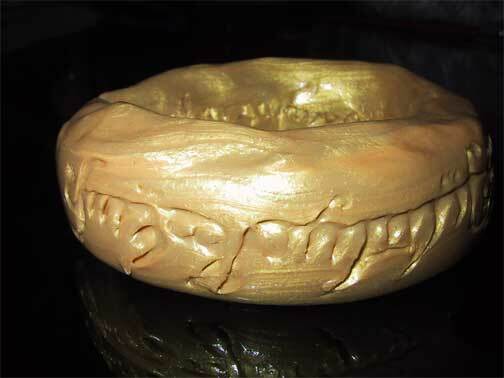 Shudder in awe of the ONE PUTTY RING TO RULE THEM ALL!